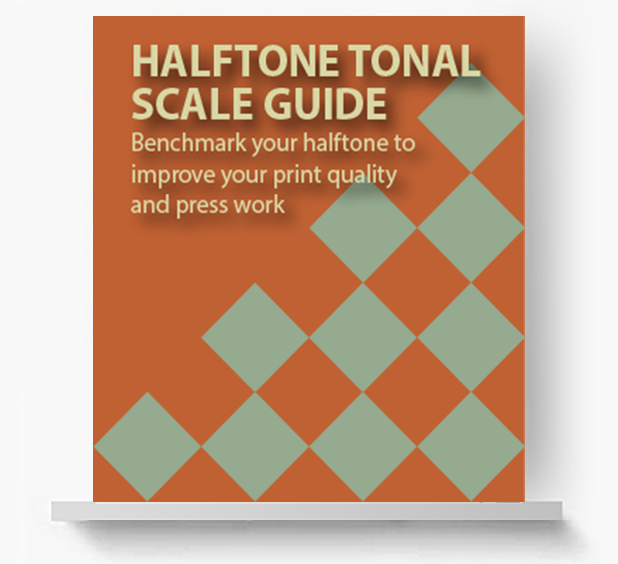 During my consults, I use this Halftone Tonal Scale Guide to benchmark the screenprinting process. It consists of a 300 pixel, black and white grayscale image with a full range of tones, that is 11.5-inches square that can be scaled down to fit your press size, and 4 scales from 0 to 100-percent. The tool is used to assist in benchmarking the following and much more. Calibrate the output device to assure that it is capable of holding the dots from 1 to 100 and that they are correct in size. Assist in choosing the correct mesh count, thread diameter and emulsion to best hold the detail. Assure that the emulsion over mesh ratio is correct. Calibrate the exposure to ensure that the exposure unit is holding the dots in the stencil. Calibrate the parallel and geometrical plane of the screens on press. Calibrate the platens or press bed for geometrical parallel and plane in relation to the stencil. Assist in choosing the best fill blade setup to properly fill the mesh openings with ink. Assist in choosing the best squeegee durometer, speed and angle across the image. Assuring the ink is capable of holding the best resolution and has been modified correctly. To perform crocking tests and laundry test for proper cure. Due to the size of this file, it may take some time to download, depending on your Internet download speed. Please stay on the page until the file transfer is complete. If you forget where you saved the file on your hard drive, search for Halftone-Tonal-Scale-Guide. The photo is part of the old Cathedral in Antigua Guatemala, which was only partially restored after its destruction in the 18th century. I took the photo during a trip to Antigua and I own the copyright on the photo, but your purchase gives you permission to print it for test purposes. Please read Our Policies page before purchasing our products. There are no refunds offered for digital products. Please read the description to assure that you understand what you are purchasing. If you have any pre-purchase questions regarding the item, we will be happy to answer them.